The ruby anniversary is a special one. Spending 40 years together is a great reason to celebrate! 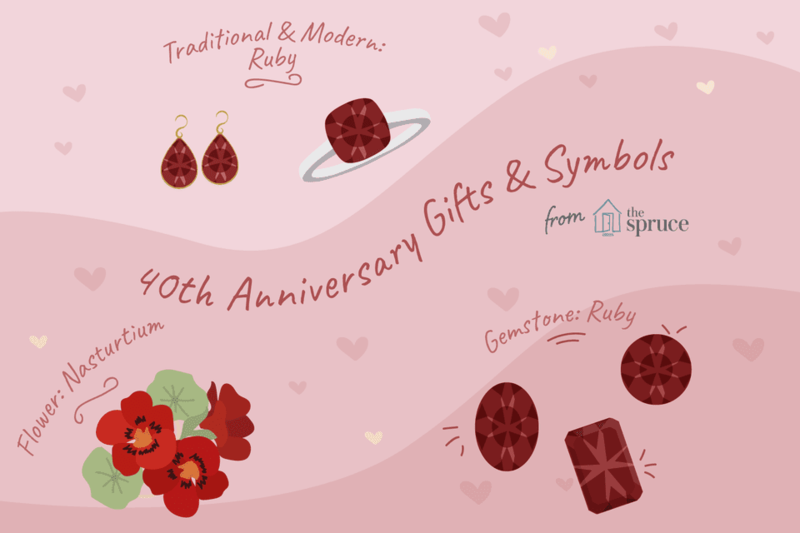 Here are some 40th wedding anniversary ideas and symbols to help you choose gifts associated with your 40th ruby marriage anniversary that will be both personal and meaningful. Ruby, because rubies are thought to possess an eternal inner flame which is a symbol that the passion in a marriage is still very alive and strong after 40 years together. Use sparkly ruby red glitter on flowers, cards, centerpieces, gift wrap, balloons, etc. Set the table with a paper ruby red tablecloth, rent china, and crystal with ruby red trim or tint, use ruby red looking votive candles, place flowers in ruby red colored vases. Toast one another with a ruby red wine. Plan a picnic with paper ruby red colored plates and cups. Purchase tickets for a movie, sports event, concert, theater, etc. and wrap with a ruby ribbon or place in a ruby red box. Plan a trip to Ruby in Arizona or South Carolina, Ruby Valley in Nevada, or the Ruby River in Utah, Ruby River in Washington State, Ruby Falls in Tennessee, the Ruby Golf Course in the Bahamas, or to a Ruby Mine in Cherokee, North Carolina. Ruby red paperweights and wall decor. Put together a playlist with songs from the era of the marriage date. Assemble a memory photo album with pictures highlighting 40 years together. Include the wedding, children, grandchildren, friends, trips taken together; homes lived in, etc. A nice addition is to include stories from children and friends. Create a poem, write it in ruby red ink, and display it in a ruby red colored frame. Put together a family quilt comprised of each square created by a family member or close friends. Make a wish tree. You can use a big branch that you paint ruby red and decorate with ruby red ribbons, ornaments, etc. Fill the branches with pictures of major events in your life, people who love and cherish you as well as tickets for a trip, travelers checks, gift certificates for different events and restaurants you could use on a trip, etc.